Hope Street demonstrates how a project can see great success when steered by clear leadership, exemplified by the cooperative and seamless relationship between Liverpool City Council, Liverpool Vision and Liverpool 20:20 in delivering innovative public realm design. Subtlety in public realm improvements is understated – small changes that are appropriate to, and enhance the historic urban form and scale of the street can be very effective. These changes in public realm improvements can also act as a catalyst for wider urban change, promoting cultural and economic value in the local area. Through the reprioritization of traffic management, Hope Street was successful in building a street that encouraged pedestrian functions and ease of movement, creating a safe and friendly pedestrian environment and ultimately shifting attitudes about car use. Acting as both a destination as well as an important interconnection, Hope Street is versatile in form and function, incorporating mixed uses and integrating urban life in the local area and the city as a whole. Historically, there appears to have been a strong network of interrelated groups working together in this area, and the recent public realm works have acted as a catalyst to strengthen these working relationships. Hope Street, a truly urban street, is deeply in the urban grain of this part of Liverpool, at the threshold to the city centre. It runs along an escarpment such that as you cross it, the road falls away before you as you enter the city centre. Great views to the river and the hills of North Wales open up on a clear day. The street forms the backbone to this cultural quarter of the city linking the Roman Catholic and Anglican cathedrals with the magnificent 18th Century Catherine Street, Upper Parliament Street, Rodney Street and Brownlow Hill. Hope Street has a strong physical character defined by the high quality of architecture, and a high level of interconnection with surrounding streets. It has an excellent mix of cultural venues ranging from the Philharmonic Hall (and famous pub), the Everyman and Unity Theatres, Liverpool Institute for Performing Arts (LIPA), Blackburne House (Women’s Centre) and Liverpool Art College, various cafes, the trade union sponsored Casa Blanca Club, commercial buildings, the Hope Street Hotel (a converted carriage works with urban beehives on its roof), all accompanied by residential accommodation. This is truly an urban street performing as a destination as well as a place of urban interconnection. However, like many other such urban streets, just ten years ago Hope Street was dominated by vehicles with a public realm arranged more for the free movement of cars and parking than human interaction. 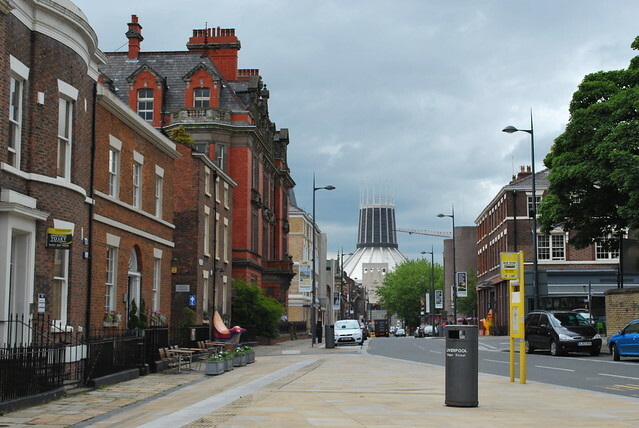 There appears to have been a strong urban community in the area and in 2009 the Hope Street group was established to promote the street as a major asset in Liverpool’s tourism economy with the aim of increasing visitors and vibrancy in the area as a whole. The catalyst in making this change was an innovative example of public realm design, headed by a seamlessly joint client Liverpool City Council, Liverpool 20:20 and Liverpool Vision. The public realm scheme has acted as a major catalyst in creating the right environmental conditions to attract private sector investment to raise the profile of the area for business and promoting the street as a major city-centre destination. This was followed by granted aid programmes to assist building owners in renovating facades and installing floodlighting. The most spectacular scheme being on the catholic Grade II* Metropolitan Cathedral of Christ the King, with its new grand entrance stair added in 2003. The design and detailing of the public realm works is excellent. Fundamentally, the design places pedestrians in priority over the free flow of traffic. Footpaths have been widened and realigned to allow the free movement of pedestrians up and down and across the street. When walking, the route feels quite natural – as it should. Much of the existing York stone paving has been retained, and where needed, new stone and matching granite for kerbs has been brought in to produce a street and public realm that has a historic feel and character, appropriate to the surrounding buildings. Bespoke corners at crossings allow pedestrians to cross the street freely. Corners have been restored to their Georgian radii but set to fall to carriageway grade to facilitate not only wheelchair access but also the roll-over of lorries. With careful detailing and strong foundations, this has been a successful measure, and remarkably, has not attracted the installation of bollards by safety auditors. Highway clutter has been removed throughout and new street furniture, lighting columns etc. have been installed to create a fresh relationship between the new and old. An interesting new paved carriageway space has also been created in front of the Philharmonic Hall with beautiful part-polished stone bollards, which encourage casual sitting and also provide events that happen frequently during the year with a functioning space. At the junction with Mount Street, a new space has been laid out creating a gentle connection between different levels, which, with public art, is a pleasant place to sit and absorb the happenings of the street. It has become a popular place to have a wedding and a popular photo-op for tourists. Hope Street is a street that seems to be continuously transforming and adapting through new developments. The most recent is the reconstruction of the Everyman Theatre, but also plans are in place for the Philharmonic Hall and further extensions to the Hope Street Hotel into the listed classical modern former Blind School. Whilst the public realm works will not have been the only enabler for these changes, it does seem clear that the work has acted as a catalyst to make things happen between the public, private and third sectors. Is this perhaps the only street with at least four web-sites directly relating to it and its host of cultural activities?